Liz and I attended the launch of space shuttle mission STS-126 on November 14, 2008. This resupply and repair flight to the International Space Station (which I had visited with my STS-98 crew in 2001) took on an ambitious array of tasks, from installation of interior facilities for expansion of the ISS crew to 6, to a complicated repair of the starboard Solar Alpha Rotary Joint (SARJ), the ferris-wheel-like joint that allows the right side solar array to swivel like a paddle wheel to track the sun. 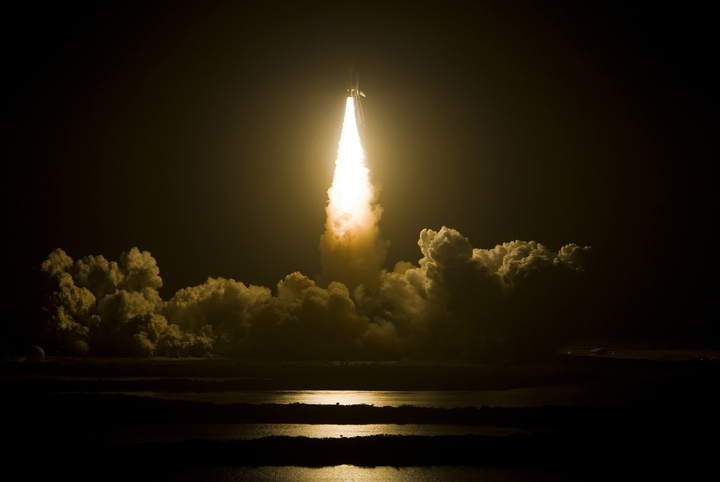 The launch itself came on Friday night the 14th at 7:55 pm, EST, into a clear, calm night sky. A high layer of cirrus was backlit by a nearly full Moon. I’ve seen night launches before, but never one this dramatic. Endeavour lit up the Cape in a flickering, orange-yellow glow, even as the sound from the shuttle’s boosters smacked across the press site and shook the Vehicle Assembly Building across the road. A minute into the flight, supersonic, Endeavour tore through that high cirrus layer like an incandescent needle through canvas. As the shuttle’s shock cone pierced the clouds, it spread a widening ripple in the layer of ice crystals, revealing the black sky above. The hole blown through the Moon-lit cirrus layer brought gasps of awe from all of us on the ground! “…The road to Bastogne had been worked over by Ninth Air Force Thunderbolts before the Third Army tanks [under Patton] finally cleared the way. A colleague and I drove up to Bastogne on a secondary road through breath-taking scenery. The Thunderbolts had created this scenery. You can say the words “death and destruction” and they don’t mean anything. But they are awful words when you are looking at what they mean. There were some German staff cars along the side of the road. They had not merely been hit by machine gun bullets; they had been mashed into the ground. There were half tracks and tanks literally wrenched apart, and a gun position hit directly by bombs. All around these lacerated or flattened objects of steel there was the usual riff-raff: papers, tin cans, cartridge belts, helmets, an odd shoe, clothing. There were, also, ignored and completely inhuman, the hard frozen corpses of Germans. …We had watched the Thunderbolts working for several days. They flew in small packs and streaked in to the attacks in single file. They passed quickly through the sky and when they dived you held your breath and waited: it seemed impossible that the plane would be able to pull itself up to safety. They were diving to within 60 feet of the ground. 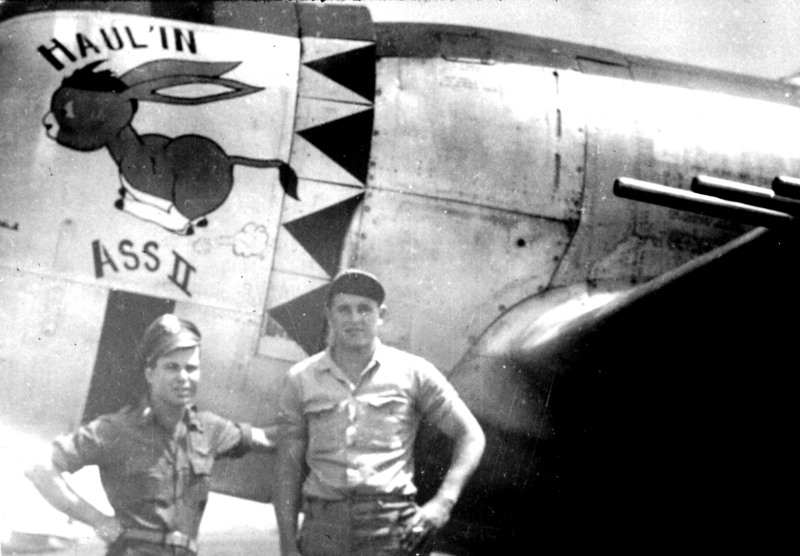 Gellhorn was a frequent visitor to the Hell Hawks’ base, and even flew over the front in one of the 365th Fighter Group’s 2-seat P-47s. Some of the men resented her presence; others winked at the celebrity hoopla and Gellhorn’s friendly relationship with their commander, Col. Ray J. Stecker. Gellhorn had friends among the pilots wherever she went, and respected their work. Her book captures the destruction along the front and the attitudes of the men who rained such devastation on the heads of the Wehrmacht. 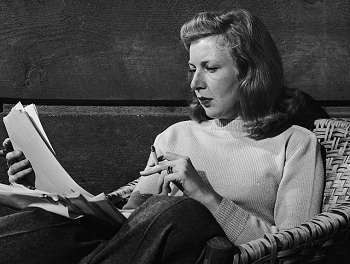 Martha Gellhorn editing "The Face of War"
How the Hell Hawks saw the fighting in the Bulge occupies two chapters in Hell Hawks! 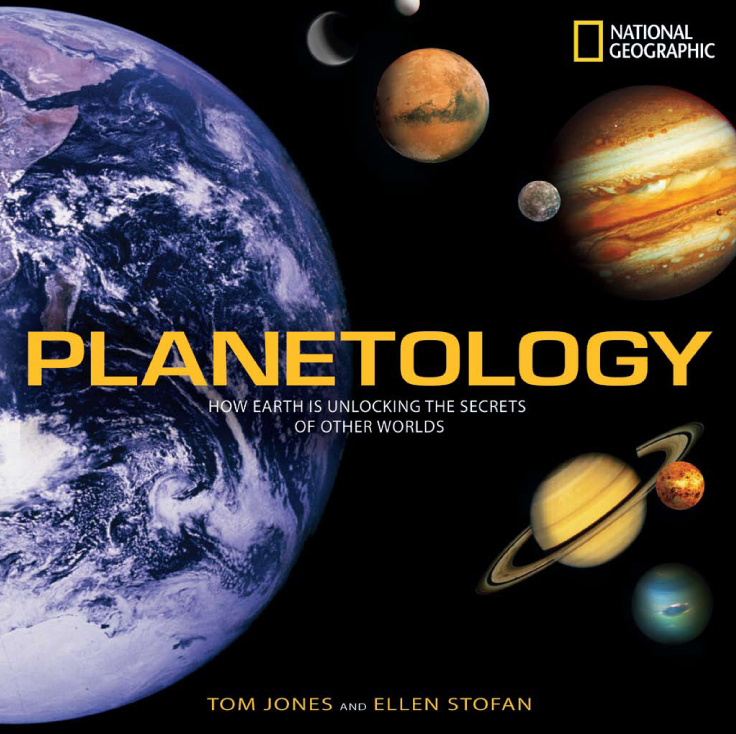 — now the best-selling title at the National Air & Space Museum. Celebrate American’s servicemen and women the week of Veterans Day: Join me for a Hell Hawks! 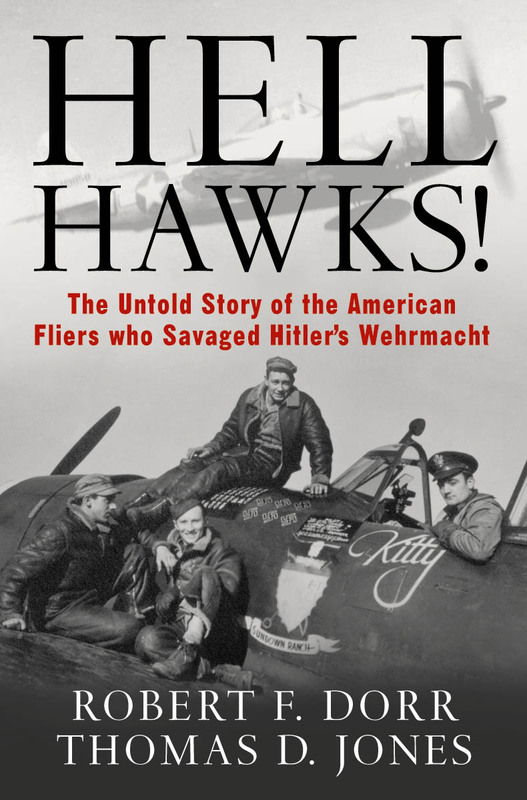 talk and book signing at the National World War II Museum on November 15. 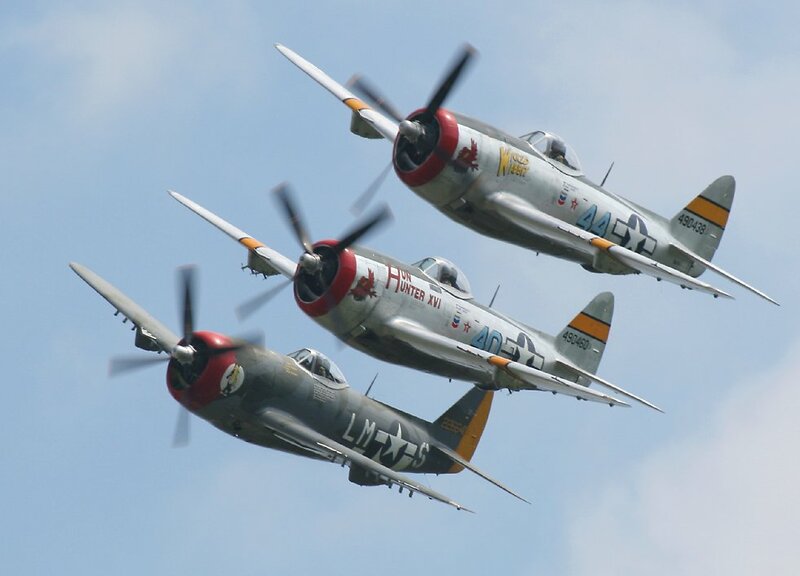 My talk on this aerial band of brothers and their combat experiences flying the P-47D Thunderbolt against Hitler’s armies will take place at the Museum at Noon. I’ll be at the Museum store through 4 pm to sign copies of Hell Hawks! and talk with veterans, visitors, and those who would salute these heroes. More information on my astronaut speaker appearances at www.AstronautTomJones.com. “Mac” McWhorter, Red 3, with 1st Lt. Robert S. Maney flying his wing, heard Porter call out the bandits and direct the flight to “prepare to drop belly tanks in ten seconds.” “The hell with waiting,” thought Mac. “I dumped mine immediately . . . and looking up saw [my drop] was in last place!” Following Porter, he climbed through eleven thousand feet at three hundred miles per hour, chasing a flight of Messerschmitts, which scattered and fled. Bouncing one, McWhorter caught his enemy in a climbing right turn at about 270 to 300 miles per hour. He fired a burst that peppered the dark gray fighter’s left wing and chopped loose its left main gear. As the 109 tightened the turn, Mac squeezed off a second burst that riddled the 109’s fuselage and tail. Maney, concentrating on clearing McWhorter’s tail, never saw the enemy but caught a glimpse of the shell casings and belt links pouring from his leader’s wings. He thought for a terrible instant that Mac’s Thunderbolt was disintegrating, hammered by strikes from a German coming head-on. Instead it was McWhorter who had the range. He fired again just as the enemy pilot jettisoned his canopy. Too late: Mac’s eight fifties blasted the enemy’s cockpit and engine. The Messerschmitt’s Daimler-Benz engine froze, and flames erupted from the 109’s cramped cockpit. McWhorter saw his victim, spinning and aflame, hurtle down to spray a fireball across the landscape below. “In that forty-five seconds or a minute, I didn’t have time to think about that pilot,” said McWhorter. “That 109 was just a target.” He pulled up and circled, looking for more, but by then the enemy was gone. He had a confirmed kill, and his courage and skill were recognized by the award of a Distinguished Flying Cross. Edgar Kiefer contributed to our research by sharing with us his self-published memoir, A P-47 Pilot’s Recollections of his WWII Battles (written with his son, Richard Kiefer of Boulder, CO). Both men were brave young Americans in 1944-45, a time (like today) when our nation is in vital need of their determination, dedication, and deadly earnestness in combat. Men like McWhorter and Kiefer will be the subject of my upcoming Hell Hawks! talk to the Service Academies Association at 0745 on Friday, December 12, at the MARRIOTT HOUSTON WESTCHASE HOTEL, 2900 Briar park, Houston, Texas 77042. Hell Hawks! remains the top-selling title at the National Air & Space Museum. For more of my astronaut speaker appearances, in Houston or nationwide, please watch this space. I’ll also be signing Sky Walking: An Astronaut’s Memoir, at the Kennedy Space Center Visitor Complex on Nov. 14, 2008, from 1230-1430. October has been a productive month for getting some of my interests into print. The American Institute of Aeronautics and Astronautics publishes “Aerospace America” every month, and in October my “View from Here” column appeared. My topic was dealing with the impact hazard from Near Earth Objects: 2008 TC3 collided with Earth on October 7th, making my report on the need for a decision-making agreement to deal with a future rogue asteroid a timely one. You can read Asteroid Deflection: Planning for the Inevitable online and in the October issue of Aerospace America. Speaking of 2008 TC3, I reported on its collision with Earth and the need to prepare for a future rogue asteroid in Why the World Needs Asteroid Insurance: Resident Astronaut on Popular Mechanics‘ web site, October 9, 2008. Keep an eye out for my continuing space comments at their site. My article on the early space race and the US effort to put a man in space, Mercury Rising, appeared in Invention and Technology‘s fall 2008 issue. I interviewed Mercury astronaut Scott Carpenter for the article, which is beautifully illustrated with mission photos and developmental drawings of the Mercury design. I’ll post a pdf version of the article shortly at my website, AstronautTomJones.com. All of these intriguing topics are sure to be featured in my upcoming astronaut speaker talks, and I’ll post my upcoming appearances in a future entry here at Flight Notes. 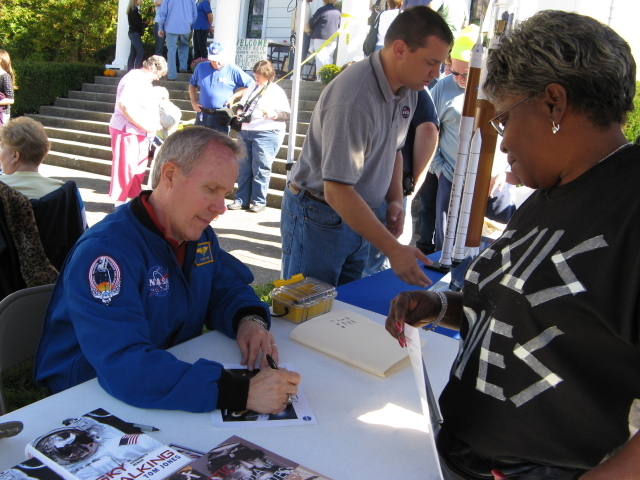 Last Saturday, October 4, I was a guest in Coalwood, WV, at the 10th annual October Sky Festival, hosted by Coalwood citizens and best-selling author Homer Hickam. The day was blessed with beautiful early autumn weather: temperatures about 70 under a cloudless blue sky. The forested ridges surrounding the little town (population, 180, down from 2000 sixty years ago) where Homer grew up were brushed lightly with the first traces of yellow, orange, and rust-red. 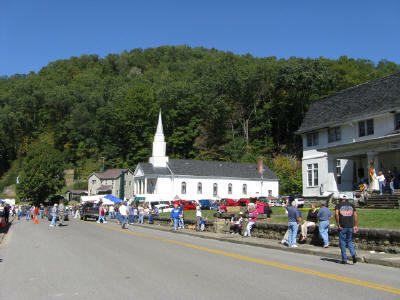 The mining town’s main street was lined with art and craft vendors, food stalls, and plenty of happy families. 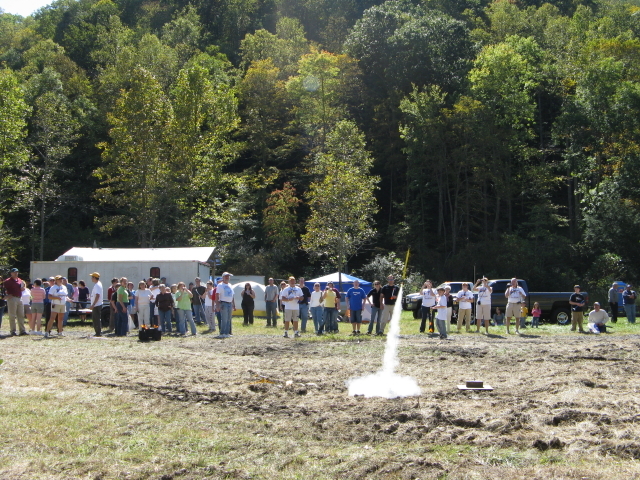 Along with Homer’s boyhood pals, I participated in a series of model rocket launches just after lunch at “Cape Coalwood,” where Homer and the Rocket Boys once lofted their home-built missiles. Most of Saturday’s rockets managed to parachute back into the former mining dump site without damage, although the surrounding tall trees claimed a few reentering vehicles. Homer’s latest book is Red Helmet, and he always had a line out front of the Methodist Church for signing. My table was on the church’s front lawn, where I signed copies of Hell Hawks! and Sky Walking through the day. With both my grandfathers having worked in the coal mines of Wilkes-Barre, PA, my visit to Coalwood was a glimpse into their lives 75 years ago. For a day, at least, I could trace a direct path from the mines to the stars. Plan on visiting the October Sky Festival in 2009.